Today finds us settled in at the Melkevoll Bretun Camp Site which lies in the midst of glaciers, waterfalls, mountains, lakes and rivers, and undisputedly, it's an area of incredible natural beauty in western Norway. 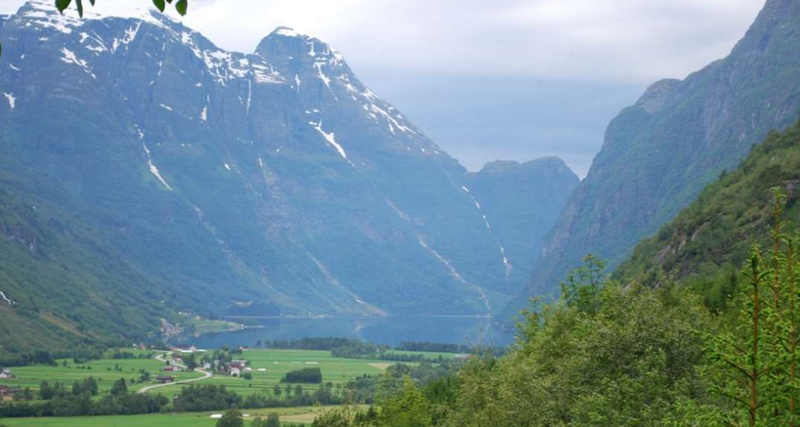 The site lies right on the edge of Jostedal Glacier National Park, and two of the longest fjords in the world can also be found nearby - Sognefjorden and Nordfjorden. We picked this particular site because it came highly recommended by several other motorhomes who's blogs I read Home on Wheels, Moho-Dream, Our Tour, Our Bumble and they certainly weren't wrong. 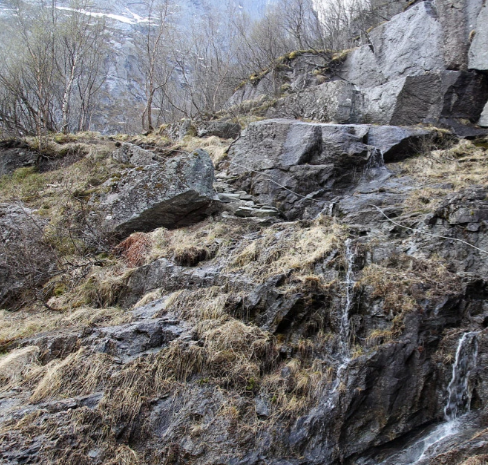 All around us is the sound of crashing water, some of which is coming from the 350 metre high Vole Waterfall (the 45th Highest in Norway) which is almost right behind us, and the rest from the tumbling turbulent gushing waters of the melt water river that the waterfall feeds. The river also runs right by the amenity block in which there is a sauna and John was taken quite by surprise when a naked lady 👵 rushed from it's hot confines and plunged into a natural basin that the iced water had formed😮😂😂!! I didn't think I'd better put the lady on!! This morning rain stopped play for a while, but in a way that was a good thing because it allowed me to catch up with our laundry mountain and also plan our Winter Sun 'Holiday' to Spain for the end of this year and the beginning of next. However, after lunch the weather improved a bit so we set off for a short walk to see one of the tongues of the Briksdal Glacier which is apparently one of Norway's most visited tourist attractions. 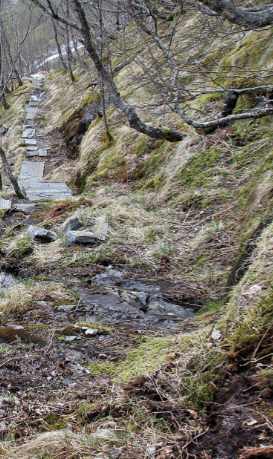 To get there you can either walk or take a Troll Buggy, but with the awe inspiring waterfall that soaks you as you pass the former was the much more fun option! This waterfall above (and there were several others), is mostly melt-water from the glacier and it rages down at a rate of 10,000 litres per second so it really does make you wonder how the glacier doesn't just melt away altogether, but even though that hasn't happened yet, this particular glacier is receding and this was demonstrated by signs that indicated where it used lie right back as far as the year 1800, and apparently as recently as 1996 it used to cover the entirety of the lake that now lies in front of it. Once we reached the end of the trail we stood mesmerised by the beauty of both the blue glacier (which is the result of ice crystals reflecting sun light) and the pure clear water's of the lake, and it seemed almost wrong to just walk away again - but as I'd forgotten to pack our trusty coffee flask that's exactly what we had to do after we'd spent a short while gazing at all that nature had to offer there! Today the weather really wasn't very good - we had frequent rain showers, lots of low cloud and at times it was quite windy! But within the valley that this camp site lies these frequent changes provided quite a dramatic back drop for today's walk. We'd decided to head for a track that leads up towards the edge of Brenndalsbreen Glacier which is an arm of the great Jostedalsbreen Glacier, and the bit we were heading for is situated on the side of the Oldedalen Hanging Valley. In times gone by the glacier used to completely cover the area where we walked, but climate fluctuations have caused alternating advances and retreats of it's edge, and the info boards informed us that 'Brenndalsbreen is now hibernating well back in this beautiful valley'. Therefore to get anywhere near the glacier edge we had to walk steeply uphill for about 2 miles, and even then, because melt water had caused a churning river to flood we couldn't get as close as we'd have liked - part of the wooden bridge had completely washed away and what was left didn't look safe! However, that was possibly a good thing because we also read how rampant natural forces sometimes and without warning dispatch spectacular ice avalanches down the hillsides! 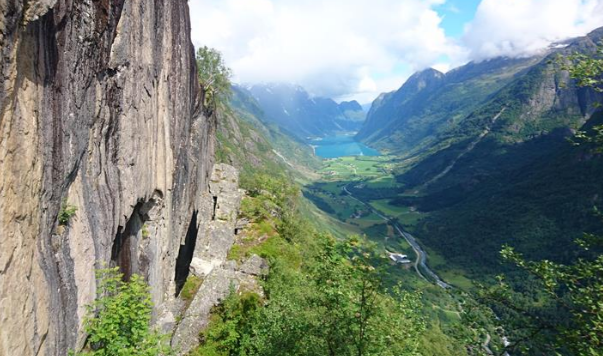 The trail led us through some wild and impressive scenery and also to a spectacular view point that overlooked Oldedalen and a blue green lake beyond. But it was here that I nearly had a little accident, because with all the rain the mossy rocks were like ice! As we neared the glacier we entered Jostedalsbreen National Park which was established in 1991 and covers an area of 1,310 square kilometres, and within it's boundary it contains the biggest glacier on European mainland which measures 800 square kilometres. Much of the rest of the park is mountainous and because of all the flooding it was not a suitable place for us to roam, therefore as our way forward was blocked we decided to just retrace our steps and try to get home before the hovering clouds dropped a deluge on our heads. This morning we planned to spend some more time out in the big gym that nature has provided, but although our cardiovascular systems got a bit of a workout it wasn't quite as extensive as we'd first planned! We left T4rdis2 at around 10.30am with a plan to hike along part of The Oldeskaret Trail which is an ancient travellers way through a high mountain pass that traverses between 2 glaciers. However, we soon realised we'd bitten off more than we could chew!! The trail in it's entirety is identified as a RED ROUTE, so on the scale of green, blue, red and black, ranging from 'easy to extreme' we fully expected this one to be quite challenging, and we'd read that the further you went the harder it would get with areas towards the top being roped to help with your ascent! But we didn't get anywhere near that far because even at the start of the hike the path was very steep with constant slippery muddy patches where I thought I might end up coming down faster than I would have liked!! We struggled up the first mile or so of it, but then brought our better judgement into play and decided to go back before one of us had a mishap that might interfere with our ongoing travel plans! However, while we were out we did enjoy our time on the trail as we listened to joyful birdsong, cascading water that kept us company for most of the way, and we also admired more stunning views - or at least we did when we dared take out eyes off where we were putting our feet! So we were back at T4rdis2 by about 12.30, and once a cuppa had been slurped we put our time to good use by having a good old fettle and clean of all T4rdis2's very dusty nooks and crannies - and after we'd done the whiff of 'Eu-de-Clean' was very rewarding! Tomorrow we're going to move on again to a destination still to be decided, but before we get anywhere we're fairly sure we'll have to do battle with several dozen coaches as they bring cruise ship passengers to visit the Briksdal Glacier along the partly single track road that will lead us back to Stryn!